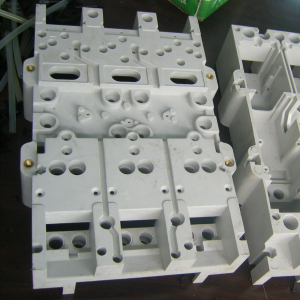 Compression molds have two parts that form the product shape when it is closed. Pre-heated material is placed in one part of the mold. The two parts are then closed and then compressed. The pressure from the molding machine distributes the material in the mold cavity. Pre-heating the material enables it to conform to the mold better. Pre-heating the molds helps to keep the material from cooling too quickly. The molds then liquidy and solidify the material. The curing process enables the material to harden thereby allowing the product to hold its shape when the mold is opened. Depending on which material used, it can take from a few minutes to several hours to cure. A smooth surface is one of the benefits of compression molding. Products tend to fit well; like rubber gaskets. Take a look at pictures from the factories!